This has been an exciting winter on two fronts. First, I am averaging a consistent 80% ringer average in my backyard blue clay pit. Secondly, I’ve begun to design horseshoes that are specifically designed to reduce or stop bounceback. I will describe the horseshoe creation process first. While recording the result of each horseshoe thrown, I noticed an unacceptable number of bouncebacks. These were good ringers that bounced off the stake. It was this revelation that was the genesis of my search for a horseshoe that reduced or stopped bounceback. I had no idea what I was getting into. As I have mentioned before, I was not happy with the number of bouncebacks that should have been ringers, but, bounced off the stake. I had also heard that there had never been a world champion that flipped the horseshoe. Frankly, I don’t know if that’s true, but, it became a challenge to see if I could improve on the odds. I calculated that using a standard “U” shaped horseshoe, without ringer break, provided 3-3/4″ of surface at the back of the shoe that could produce a bounceback. I also surmised that a turner has the advantage of hitting the stake a glancing blow and widens the 3-1/2″ opening by it’s rotation. It was also apparent that back of the horseshoe absorbed the total impact of a flipping shoe. So, was it possible to reduce the speed at impact and reduce the potential of bounceback? The first problem was developing a prototype that worked, but, also conformed to the specifications established by the NHPA. Weight became the biggest challenge. Trying to add design features and stay within the 2 pounds 10 ounce limit was difficult. Next, trying to find a foundry willing to cast a single prototype at an affordable price was the next challenge. Submitting a pattern that the caster could work with was next. It was particularly rewarding, then, that on Friday I received Prototype #3. I am particularly excited that it deals with both bounceback and impact speed. Prototype #3 does not completely eliminate bounceback, but, it reduces the potential from 3-3/4″ to 1/8″. It weighs in at 2 pounds 7 ounces. I am now going through the copyright process. Last Wednesday, I sent off Prototype #8 which will not bounceback. First, I was not familiar with the foundry process, i.e., metals, patterns, molding, NHPA specifications, etc. I had an idea for a particular design and turned to the web for help. I joined lots of forums dealing with mathematics, physics, metallurgy, backyard foundries, CNC, RFQ’s, etc., and posted lots of questions, some answered, some not. Thanks to Marcellus Metalcasters of Marcellus, Michigan I have seen the birth of a new horseshoe. Two weeks ago I received the first casting of Prototype #3. It is 2 ounces too heavy, but, I had included provisions for weight reduction and will be receiving a lighter version next week. The weight restriction of 2 pounds 10 ounces significantly restricts any added design features, but, I believe next weeks version will be under the weight restriction. The heavier pair that I received works exactly as I had hoped. I have been testing this shoe and believe it will reduce bounceback due to it’s shape. The only time I’ve seen a bounceback is when the shoe is over-rotated and hits high on the stake. The shoe is unfinished, no name, and unpainted, but, it works exactly as I had hoped. During the initial design phase I made contact with one of the major horseshoe manufacturers and received many emails of encouragement and welcomed suggestions. I had considered a royalty arrangement because I didn’t want to go into the horseshoe business. Unfortunately, due to the economic downturn the offer was withdrawn after 4 months. So, right now I’m limited to paying the NHPA licensing fee and pitching them myself. I am presently working on a very unique design that will absolutely do away with bounceback. My only concern is how it will flip. UPDATE — My Prototype #3 is back and weighs in at slightly under 2 pounds 8 ounces. The pronounced thumb notch fits my thumb perfectly. I practiced with them for about an hour and became accustomed to them quickly. I had one stretch of 15 ringers in a row. This may be the shoe that I send forward to the NHPA for approval. However, I will await the arrival and testing of my latest shoe. I continue to follow the belief that the pendulum swing down the target line is my best hope of consistency. It is the only way that I’ve found that permits me to spot and correct mistakes. Below is my method. I am presently using the Imperial Stinger. I will probably switch to the new Snyder Flip-Grip now that it has a thumb notch. I feel that the thumb notch on the Stinger gives me a bit more control. If I pay the licensing fee to the NHPA, I will use my own. I have moved to the left side of the approach and take a single stride. My stance is relaxed and natural with my left foot slightly ahead of the right at about 10 degrees rightward. My right foot is turned at about 35 degrees rightward. This places more weight on my right foot and allows my body to lean rightward slightly. When the horseshoe hangs naturally at my side I want the left edge to point at the edge of the approach. 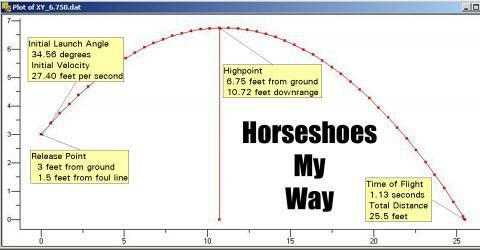 Both points of the horseshoe are parallel to the ground, with the center of gravity of the horseshoe directly over the target line and the horseshoe parallel to the front of the pit. I focus my eyes on a spot at the stake at a point 4″ above the base of the stake and don’t allow my eyes to leave that spot until I hit it with the shoe. For practice purposes I cover the stake with a black rubber hose with a notch cut out 4″ above the base of the stake. This procedure provides several benefits. One, it saves wear and tear on the stake and horseshoe. Second, it makes you concentrate on the target. Third, if you hit the spot precisely, you get immediate feedback by the sound of metal against metal. Finally, it respects your neighbors peace and quiet. I’ve attached a photo showing this practice aid. I perform a little mini swing to try to maintain a relaxed swing. I swing the horseshoe up until my right arm is parallel to the ground and the left shank of the horseshoe peripherally pointing at a spot 22″ to the right of the stake. This places the center of gravity directly over the line of flight. I pause for just a second. I release my shoulder and allow the shoe to fall naturally without muscular action. At the same time I start to bend my body forward keeping my eyes focused on the spot and start forward. It is imperative that my head moves directly at the stake. During my practice, I will sometimes focus my eyes on a spot behind the top of the stake and slightly to the left. I want to make sure that my head/eyes move directly at the stake. This insures that my right shoulder follows the target line. As I plant my left foot I release the shoe and do not allow my right toe to leave it’s original position. I have found that I feel more balanced at release if my left foot is planted when the shoe is released. Keeping my right toe planted does two things. First, it establishes my stride and, secondly, naturally slows down the stride forward. It also makes sure you don’t foul. When I finish I have the distinct feeling that I could have released a bowling ball. That’s it. My American Legion Post 7 league starts on April 20th. I’ll be moving up to 30 feet. It’s a bit awkward at 30 feet since you’re standing in the grass. The first tournament is slated for May 2.